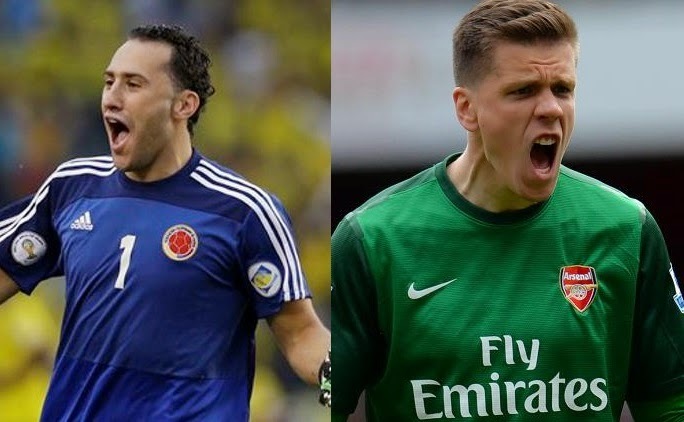 Ospina vs Szczesny, who should start for Arsenal? Ospina vs Szczesny, who should start for Arsenal?Ospina kept 12 clean sheets last season, 4 less than the Arsenal goal-keeper Wojciech Szczesny. see detail comparison here. Since the departure of great Jens Lehman, Arsenal were lacking a world class goal-keeper in their ranks. Although they enjoyed the services of Manuel Aluminia, Wojciech Szczesny, Vito Mannone and many during this time period, the constant mistakes by their goal-keepers proved decisive in this time period. Wojciech Szczesny was the better of the lot as the 24-year-old won the golden glove award last season. But as they say you learn from your mistakes, Arsene Wenger decided to keep the pressure up on the Polish for the number one spot in a Gunner shirt. Ospina kept 12 clean sheets last season, 4 less than the Arsenal goal-keeper Wojciech Szczesny. After keeping 2 clean sheets at the World Cup on the back of some marvelous performances during the competition, the Colombian gained much interest from many of the Europe’s elite including Atletico Madrid who were looking for a replacement for Chelsea bound Courtois. However, the Colombian agreed personal terms with Arsenal and decided to move on with the offer. Being the 1st choice for Nice, the Colombian hadn't enjoyed the privilege of the back two of two World Class defenders in Per Mertesacker and Laurent Koscielny, hence his saves per goal ratio is much higher than his counter-part which is a welcoming sign for Arsenal. Although Arsenal kept 16 clean sheets last season, they conceded the 2nd most goals in top 5. What can be described as a good season for Arsenal in terms of defensive stats cannot be remembered as a defensive success. After conceding 5 against Liverpool, 5 against City and 6 against Chelsea, only the naive will applaud total defensive failures against the top sides and with all sides strengthening next season, Arsenal need a leader protecting the net instead of a normal first team player and Ospina could be just that for the gunners. Last season the one-on-one saves by the Arsenal goalkeeper were as low as negligible. Szczesny likes to sit back and let the ball come, on the other hand the 25-year-old Colombian likes to make his presence felt as clear from the World Cup. So it is expected that Szczesny would start in the starting lineup however one defensive lapse and the Polish goalkeeper might be in trouble as Arsenal have another first team goalkeeper in their ranks adding to their depth.